Six years ago yesterday, in 2013, Ariana Grande and Mac Miller dropped their first ever collab, bubbly love song "The Way" featuring verses from Mac about "pickin' petals off of flowers/ like do she love me or not" and Ariana serenading him back. In the video, they flirt, dance and trade kisses, though the couple wouldn't officially start dating for years. It's fairly painful to revisit the origins of their relationship, following Miller's death from an overdose in September of last year. Nonetheless, yesterday Grande paid tribute to the song and Miller. 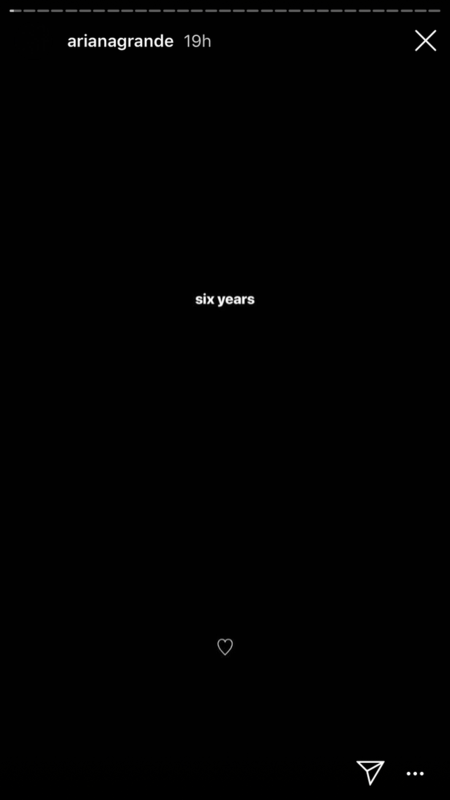 She shared a black tile on her Instagram story with a white heart and the caption "six years." Ariana also posted a shot of Mac's dog Myron, who she seems to have adopted, with the caption "real protective wit my soullll where YOUUUUUU been." Miller seems to have been on Grande's mind a lot recently on her world tour, which kicked off last week, in support of Sweetener and Thank U, Next. She's been excluding "Imagine" and "Ghostin,'" which are both about Miller, from her set-lists, explaining they're "too heavy" to sing every night, but has reportedly been playing Mac's songs as fans filter into the shows. Folks have also documented moments when she's gotten emotional singing the line about Mac in "Thank U, Next" online. Following her tribute to "The Way," Ari thanked fans for "accepting" her "humanness" on the tour.